This online space we occupy can be a little crazy sometimes. On the one hand, the flexibility of being able to work from literally anywhere and the ability to instantly share our message with just a click of a button is incredible. Never before in human history have there been the kind of opportunities that are available right now, to anyone. Whether you are starting a blog or a podcast or a YouTube channel or an online store, the possibilities are literally endless. It’s pretty amazing, when you really stop to think about it! On the other hand, this virtual world, while full of opportunity, comes with its fair share of problems too. Technical issues can make you want to rip your hair out, and sometimes just trying to keep up with an environment that is constantly evolving can feel like a full-time job. Even worse, sometimes it feels like there are haters everywhere—those people who are super quick to criticize and tear down, willing to say so many things from behind the safety of a computer screen or a Facebook group that they would never dare say to your face. But honestly, the hardest part about blogging or starting an online business is the internal battle we face—the one that happens in our own head. It’s that little voice that creeps in and tells us we’re not good enough, or that what we have to share isn’t valuable, or that we can’t do it. It’s the voice that tells us that all those people who are quick to criticize us are right. It’s the voice of self-doubt. And learning how to quieten that voice, how to silence the internal critic and instead keep moving forward is perhaps the most critical lesson we can learn. 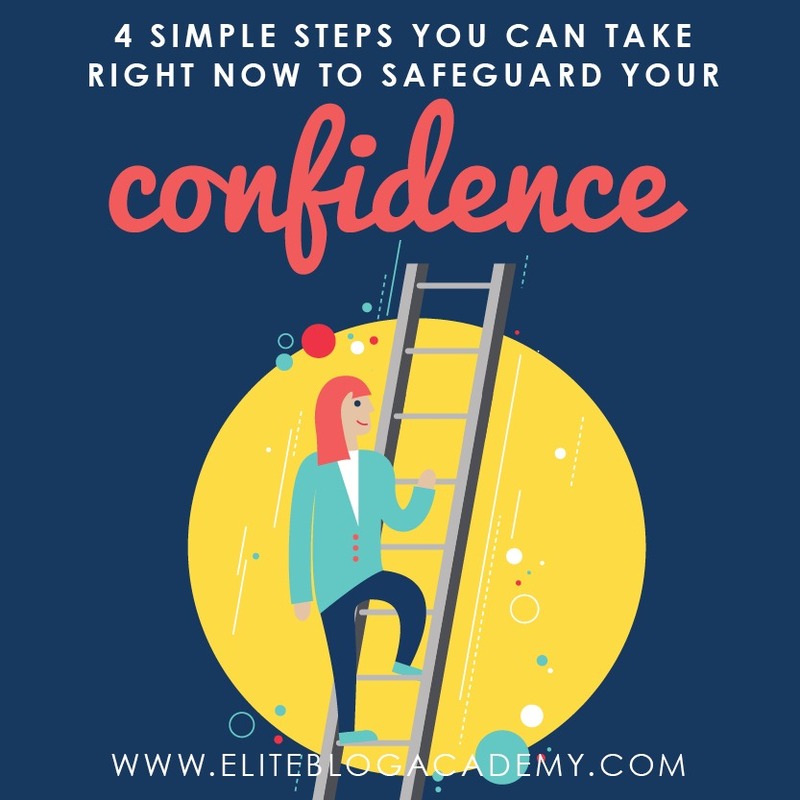 Because as bloggers and online business owners, protecting our confidence will be the most important thing we will ever do. In fact, we believe it is so critically important that we even developed a brand new 5-Day Confidence Challenge to help the members of our community do just that. It is completely free to join–simply sign up HERE. And while this 5 Day Confidence Challenge is designed to help you permanently become more confident, there are also some simple steps you can take immediately as blogger and online business owner to safeguard your self-esteem in order to keep yourself strong, even in the midst of adversity or challenges. Stop comparing your own blog or your own progress to others. You might not believe this about yourself yet, but your own experience and perspective is completely unique from everyone else, and that is what makes it valuable. Yes, there may be others writing about similar topics, but no one else is exactly YOU. The Internet is very vast, which means that there is a lot of room for many voices. The purpose of blinders on a horse is not to blind them completely, but to keep them focused on the destination and to prevent them from being distracted or spooked by periphery activity. That’s exactly how blinders should work for you too! If looking around at what other people are doing makes you feel small or insecure or like you are falling behind, then you need to stop looking. Unfollow and unsubscribe from anyone who makes you feel insecure or unworthy. Disengage from Facebook groups, especially groups where you find yourself comparing your own progress to others. Stop reading other blogs in your same niche. Pay attention to the goal that is right in front of you, and don’t worry about what anyone else is doing. Remember, when you make your blog or podcast or business about your readers or listeners or customers and how you can help them, you will forget to stop worrying that you might not be good enough. Furthermore, although it doesn’t feel like it, the fact that you know what it is like to experience self-doubt is actually a gift, because it will help you get into your readers heads and understand their fears, and show more empathy. Ultimately the thing all of us want most of all is to simply feel understood! If that is the gift you can give the people in your community, then you are ahead of the game. No matter what niche you write in, there is probably someone feeling like they are not good enough–you can channel your experience and the way you feel right now into encouraging them! We all need encouragers in our lives! When I am feeling down, the first thing I do is call my accountability partner Edie, because I know she will not only take the time to listen and sympathize with my frustration, but also help me see the positive in whatever situation I am struggling with. If you don’t currently have someone in your life who can speak truth in a positive and encouraging way, I strongly urge you to find that person. Let them know what you are struggling with right now, and that you could really use some encouragement. You might just be surprised by how supportive people can be! You might try forming an accountability group with a few other bloggers, or perhaps reaching out to a close friend offline. Or perhaps try joining an online support group, such as our Doing It Scared Member’s Only Community, which is specifically designed to provide ongoing encouragement and accountability to anyone pursuing a big goal or dream. This one can be tough—we know from experience—but the reality is that putting yourself out there and finding success means that sometimes you will be criticized. It’s not fun and it’s not right, but it is a big part of what we do, and ultimately we all have to realize that if we want to reach our goals and achieve our dreams, we have to learn how to just tune it out. Let it wash over you like a wave. Realize that the people who are criticizing often do so because they aren’t brave enough to act, and also realize that while sometimes it can feel like “everyone” is talking about you, the Internet is a huge place, and that is almost NEVER the case. Want to permanently feel more confident in just five days? Our free 5 Day Confidence Challenge is designed to help you do just that. Get all the details HERE.